With her dynamic novels in the Tall, Dark & Dangerous series, bestselling author Suzanne Brockmann has proven herself a master storyteller. Her rare gift for blending intense adventure with sensuous romance has captivated readers, who especially relish her vivid portrayals of the dashing men of the U.S. Navy SEALs. 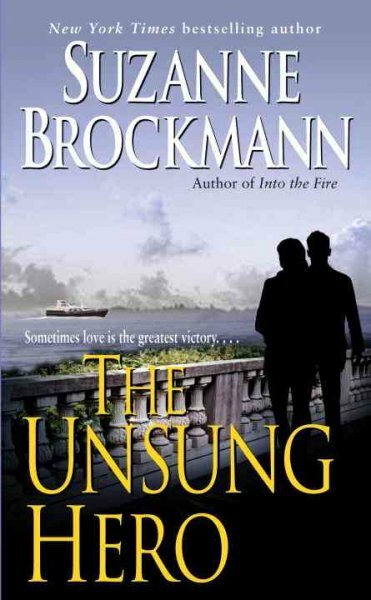 Now, in THE UNSUNG HERO, Brockmann has created her most unforgettable book yet — a poignant story of a love that will reveal hidden truths and bring two solitary people together…against all odds. After a near-fatal head injury, U.S. Navy SEAL Lieutenant Tom Paoletti catches a terrifying glimpse of an international terrorist in his New England hometown. When he calls for help, the Navy dismisses the danger as injury-induced imaginings. In a desperate last-ditch effort to prevent disaster, Tom creates his own makeshift counterterrorist team, assembling his most loyal officers, two elderly veterans of the Second World War, a couple of misfit teenagers, and Dr. Kelly Ashton — the sweet “girl next door” who has grown into a remarkable woman. Once known as the town’s infamous bad boy, Tom has always longed for Kelly. Now he has one final chance for happiness, one last chance to win her heart, and one desperate chance to save the day…. The working title for THE UNSUNG HERO was THE HERO OF BALDWIN’S BRIDGE. David Sullivan’s dream is to draw and write his own comic books. Before writing THE UNSUNG HERO, I sat down with my friend Scott, who gave me a crash course in the world of comics and graphic novels. I received email from some real life Paolettis, who were excited at the idea of the hero in a romance novel having their last name! Navy SEAL Sam Starrett and Naval Officer (soon to be FBI agent) Alyssa Locke first appear, midway through this book. Note From Suz: I’ve been fascinated by World War II since before I can remember. I was born in 1960, only fifteen years after the end of the war, but when I was a kid it seemed like ancient history. And yet I was aware of the fact that many of the men and women around me had not only lived through that tumultuous time, but had played an important part in it. My grandmother’s cousin, Elise, had worked for the U.S. Navy, as a supervisor in an ammunitions testing facility. The town photographer — who lived by himself in a ramshackle house near Bishop’s Orchards — had actually survived the Death March in Bataan, and was haunted by all he’d endured. My uncles, Fred and Jack, both served in France, and actually ran into each other in Paris, purely by luck! At age eleven and twelve, I read the entire section of the stacks in the library devoted to the history of the Second World War. I read “The Great Escape.” I read “The Man Who Never Was.” I read about the war in the Pacific, about the terrors of the German death camps, about the Blitzkrieg in Europe. I read about vast battles — the ongoing battle for the skies between the Luftwaffe and the Royal Air Force that became known as the Battle of Britain, the enormous naval engagement of the Battle of Midway. Pearl Harbor, Anzio, Iwo Jima, Dunkirk, Denmark, Normandy, Ardennes — I read of the military strategies, the defeats, the victories. And I also read of the millions of small acts of heroism, the intimate and remarkable stories of the ordinary men and woman who lived and breathed and fought in those places, whether they wanted to or not, men and women who made a difference and enabled the Allies to defeat Hitler and the Axis. And I’m still in awe. Two of my characters in THE UNSUNG HERO were young men during that time — two young American men, Charles Ashton and Joe Paoletti, who found themselves in Nazi occupied France in 1944, during the weeks immediately following the “D-Day” Invasion of Normandy. Their story, told in flashbacks, is an important subplot in my book. When THE UNSUNG HERO takes place, in August, 2000, both of those men are elderly, but they play a vital part in the contemporary action, too, even though both still aren’t talking about the ordeal they lived through more than fifty-five years earlier.